Unions from Algeria, Egypt, Libya, Jordan, Iraq and Yemen continue their reports this morning on their activities and future plans. Fathiyaah Mohamed's union represents public transport workers and was established after the revolution in 2011. She explains that whilst there are many difficult issues in the sector her union is the strongest union in Egypt that has achieved wins for workers through negotiation and protest. "Joining the union gave me strength and determination. I wanted to be first women elected since revolution. With the support of ITF's Arab Women Organiser, Samar Safan, I was elected." "We have signed a number of agreements with the support of the ITF arab world regional office. My union has had involvement agreeing social security, occupational health and safety and labour legislation. This is critical for our workforce" reported Nabil Salaman, representing cabin crew and tourism workers in Jordan. He concluded "Women sit on our union board and youth are also represented. Our priority is to train our unionists." 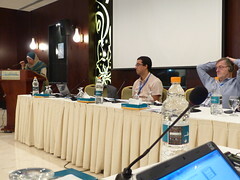 What has been the impact of the Arab Spring on trade unions in the region? What does it tell us about how we should organise? Ahmad Awad a Jordanian researcher commissioned by the ITF has been trying to answer these questions. He told the conference that while his research was not finished it was clear that the Arab Spring had been a real political shift. One of the big changes has been the emergence of union pluralism with workers having a real choice of organisations to represent them. Greater levels of Freedom of Association has been established in more countries in the region. He noted that some unions had played a central role in the political upheavals. Others had leaderships which stood aside but the grass roots members had taken part, especially young workers. The political uprisings gave young workers and women workers more confidence. This had an impact on their involvement as union activists and on their expectations of their unions. The environment for trade unions changed. For example the media in many countries do not inform people about what unions are or what they do. Unions have usually not had to worry about this before now it is something they have to think about. Another example is that the uprisings fundamentally changed the relationship between the unions and the political parties. Unions need to learn how to influence political parties while remaining independent of them.